This past November, Julianna Pena (pictured) became the first female to win “The Ultimate Fighter.” Unfortunately for Pena, she will have to wait two years to break in her six-figure UFC contract after tearing the ACL, MCL, LCL and meniscus in her knee, as well as her hamstring. Pena will wait for the swelling in her knee to subside before undergoing surgery next week. According to the report, Pena engaged in an over-aggressive training session with minimal warm up when the injury occurred. UFC president Dana White was none too pleased after hearing the devastating news. “What happened to @VenezuelanVixen at “her gym” is the most disgusting thing I have ever heard. Ranked #10 out for 2 years. #leavethatgymnow,” White tweeted. Pena is affiliated with the Sik-Jitsu team in Spokane, Washington. Fellow UFC fighters Michael Chiesa and Sam Sicilia also train at the facility. No word if that is where the 24-year-old blew her knee and hamstring. However, it’s a safe bet. Pena owns a 5-2 professional record, but snapped her two-fight skid in the biggest bout of her life by beating Jessica Rakoczy to take the TUF tourney. 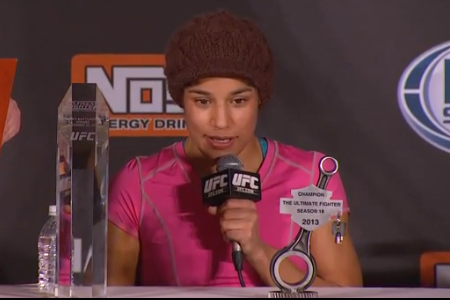 “The Venezuelan Vixen” was slated to meet Jessica Andrade at UFC 172 prior to the injury. Raquel Pennington now faces Andrade on March 15.